WASHINGTON The U.S. economy grew at a slightly faster but still anemic rate at the end of last year. However, there is hope that growth accelerated in early 2013 despite higher taxes and cuts in government spending. The economy grew at an annual rate of 0.4 percent in the October-December quarter, the Commerce Department said Thursday. That was slightly better than the previous estimate of 0.1 percent growth. The revision reflected stronger business investment and export sales. Analysts think the economy is growing at a rate of around 2.5 percent in the current January-March quarter, which ends this week. Steady hiring has kept consumers spending this year. And a rebound in company stockpiling, further gains in housing and more business spending also likely drove faster growth in the first quarter. The 0.4 percent growth rate for the gross domestic product, the economy's total output of goods and services, was the weakest quarterly performance in almost two years and followed a much faster 3.1 percent increase in the third quarter. The fourth quarter was hurt by the sharpest fall in defense spending in 40 years. For all of 2012, the economy grew 2.2 percent after a 1.8 percent increase in 2011 and a 2.4 percent advance in 2010. Since the recession ended in mid-2009, the economy has been expanding at sub-par rates as a string of problems from higher gas prices to Europe's debt crisis have acted as a drag on the U.S. economy. Growth appears to be strengthening this year even after taxes increased on Jan. 1 and automatic government spending cuts totaling $85 billion started to take effect on March 1. The Congressional Budget Office has estimated that the combination of tax increases and spending cuts could trim economic growth this year by about 1.5 percentage points. The CBO is predicting just 1.5 percent growth for 2013. But so far, the economy is showing signs of holding its own against the fiscal drag. Employers have added an average of 200,000 jobs a month since November. That helped lower the unemployment rate in February to 7.7 percent, a four-year low. Economists expect similar job gains in March, in part because a measure of unemployment benefit applications fell this month to a five-year low. Sales of previously occupied homes rose in February to the highest level in nearly three years, while builders broke ground on more houses and apartments. Annual home prices jumped in January by the most since June 2006, according to a closely watched measure. Stock prices have surged. On Wednesday, the Standard & Poor's 500 index was within two points of its all-time high. All of that is making consumers feel wealthier, which could lead to more spending. Consumer spending drives 70 percent of economic activity. 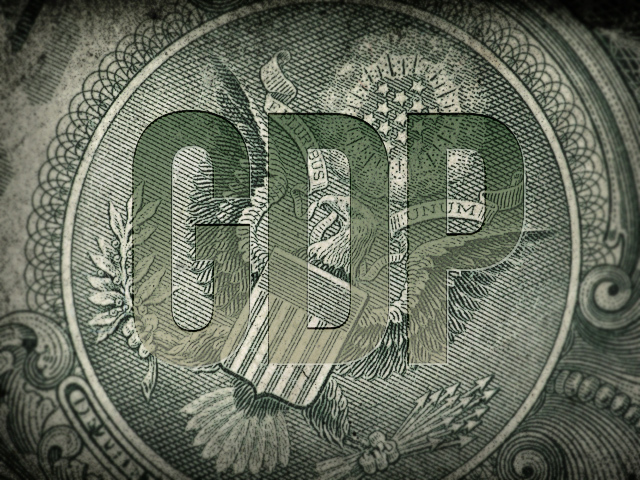 The Federal Reserve still thinks the economy needs aggressive measures to bolster growth. Last week it stood by its plan to keep a key short-term interest rate near zero until unemployment drops below 6.5 percent. The Fed also left unchanged its plan to keep buying $85 billion in bonds until it sees a substantial improvement in the job market. The slowdown in business inventories trimmed 1.5 percentage point from growth in the fourth quarter and the reductions in defense spending cut another 1.3 percentage point from growth. Consumer spending was growing at a 1.8 percent rate in the fourth quarter, slightly better than the 1.6 percent increase in the third quarter but down from last month's estimate that consumer spending was growing by 2.1 percent. That revision was offset by upward revisions in business investment spending on structures and equipment and by stronger sales of U.S. exports. The government first estimated two months ago that the economy had contracted at an annual rate of 0.1 percent in the fourth quarter, a decline that was erased by the revisions. The government will release its first look at first quarter growth on April 26.